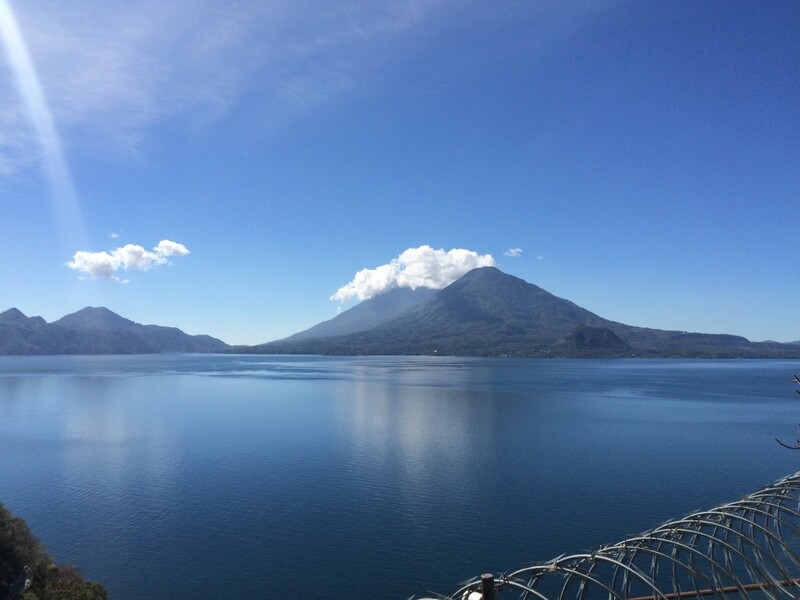 Lake Atitlan is in southwestern Guatemala. It lies in the central highlands at about 1563 m. (5,128 ft.) above sea level. The lake, 320 m. (1,049 ft.) deep, is 19 km. (12 mi.) long and 10 km. (6 mi.) wide, with an area of 127.7 sq. km. (49.3 sq. mi.). The volcanoes seen from above the lake. From here they look to be about the same height but Atitlan, on the left, is about 500 meters (1640 ft.) taller and sits well behind Toliman. About 85,000 years ago there was a large explosion leaving a huge bowl or caldera (see below) that is now the lake. There are three volcanoes or stratovolcanoes that have since formed on the southwestern shore. Atitlan is the largest, Toliman is just to the north-east of Atitlan and San Pedro is across the Santiago bay.  They are part of a long chain of volcanoes that runs through Central America and Mexico and, in turn, part of the “Ring of Fire” that circles the Pacific tectonic plate. Guatemala has some of the most active volcanoes in North America or the world for that matter. 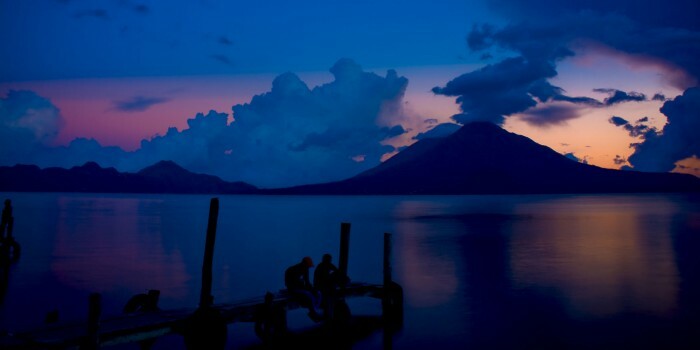 Atitlan is the largest rising 2400 m. (7868 ft.) above the lake to an altitude of 3150 m. (10,326 ft.). The southwestern side of Atitlan slopes down to sea level. This is a truly massive mountain. In comparison Mt. Washington, the largest mountain in New England, has an altitude of only 1917m. (6288 ft). Toliman sits in front of Atitlan and rises 1900 m. (6228 ft.) above the lake. Across the bay is San Pedro at 1500 m. (4917 ft.) above the lake. Atitlan erupted in 1827 and again in 1853. It is described as being dormant (let’s hope it stays that way) and fumarolic. Toliman and San Pedro are extinct. Guatemala has 21 volcanoes, four of which have erupted since 1964. Pacaya, above Esquintla, has been very active in the last few years. Fuego, (“fire” in Spanish) next to Antigua, is usually smoking. In fact it really started kicking up in May, 1999 but has since calmed down. Santa Maria, outside of Quetzaltenango, gave everyone a good scare a seven or so years ago. Some areas had to be evacuated. Caldera: The Spanish word for cauldron, a basin-shaped volcanic depression; by definition, at least a mile in diameter. Such large depressions are typically formed by the subsidence of volcanoes. Crater Lake occupies the best known caldera in the Cascades. Fumarole: A vent or opening through which issues steam, hydrogen sulfide, or other gases. The craters of many dormant volcanoes contain active fumaroles. Pyroclastic: Pertaining to fragmented (clastic) rock material formed by a volcanic explosion or ejection from a volcanic vent. Calle Santander 5-51, Zona 2 Panajachel, Sololá.